This coming Saturday (20th April) I'm going to facilitate another UpCycling Workshop at the Green Living Centre on King Street Newtown. I think it is fully booked but there is a wait-list and if this workshop is successful, the centre will probably run it again. Here is a link to more info and the wait-list. 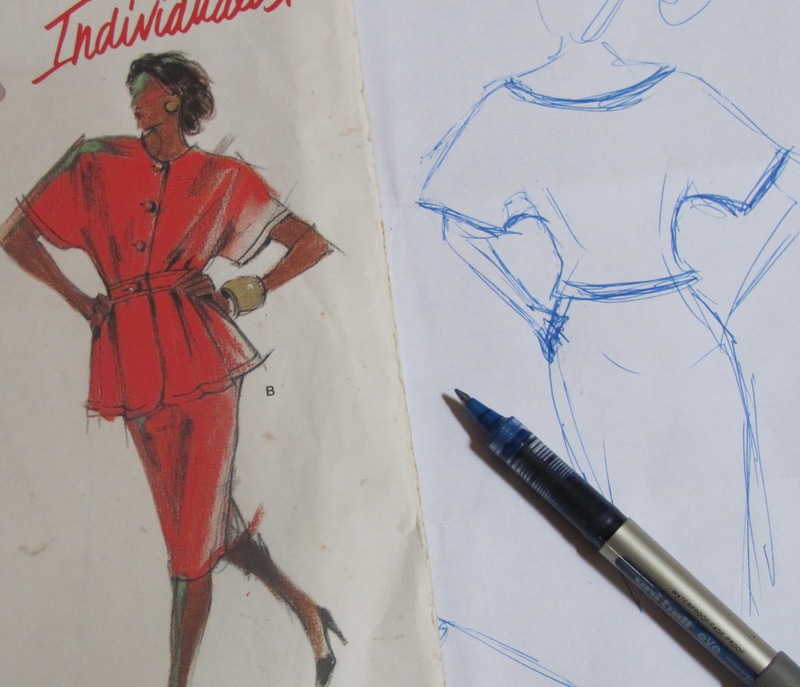 This workshop will be all about updating commercial sewing patterns. There is nothing quite as dated and out-of-style as something that has recently been very fashionable. Well - let's look at one of those patterns again. The flipped-out Farrah Fawcett hairstyles effectively date this to the late 70s and look at the price - $3.50! 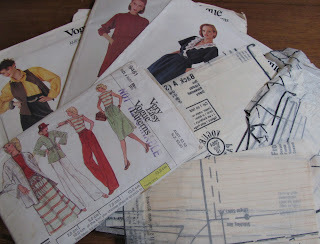 Another good reason to re-use old sewing patterns is the cost of new ones! 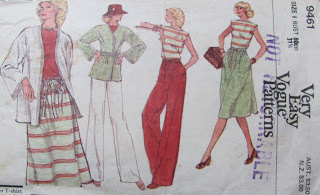 But these styles are old enough to be fashionable again. Paper-bag waists are totally in fashion once more and that little cap-sleeve top is quite cute esp. if done in a plain fabric. 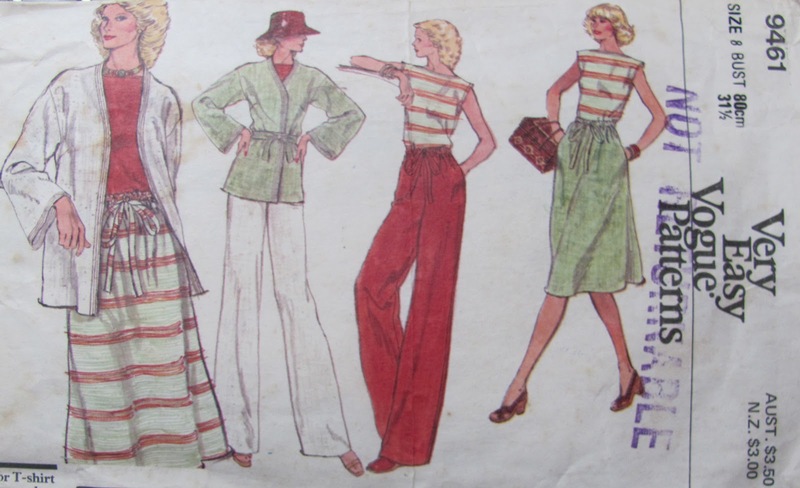 However, this pattern is a size 8 and that is a 1970s size 8 ! Some basic grading can bring this pattern up to a modern size 10 or 12. The skirt is a basic straight style with a little split at the back - a classic. But the top is a different matter - massive shoulders, close plain neck-line, a long peplum & buttons makes this a very dated 80s look. But - here is a quick idea - badly sketched (sorry). 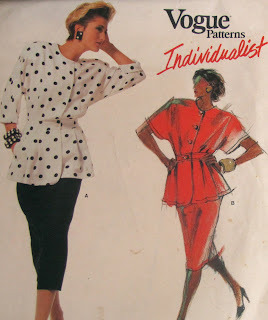 Scoop out the neck, make the shoulder line more natural, delete the buttons & peplum and we could use this pattern to make a nice batwing sleeved top. Very now! Here is another 80s pattern - a rather Princess Diana inspired look here - all pretty and demure with the lace collar, thin belt and long skirt length. The shoulders are big but a cross over dress is always flattering and easy to wear. 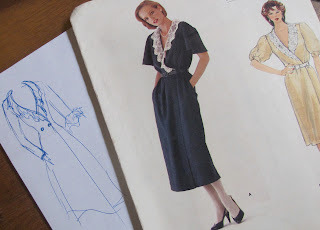 Again, my quick sketching is not very skillful but if we reduce those shoulders, give the dress slimmer sleeves, add flair to the skirt and make it a better length - we could make the dress button up and instead of lace put on a floaty bias fabric collar / frill. Far more wearable. This is the sort of thing we'll be doing this Saturday - how to look at our out-of-date sewing patterns with fresh eyes and how to make some alterations to the patterns so we can make fashionable garments that fit. Yellow & Fluffy ... again ? !